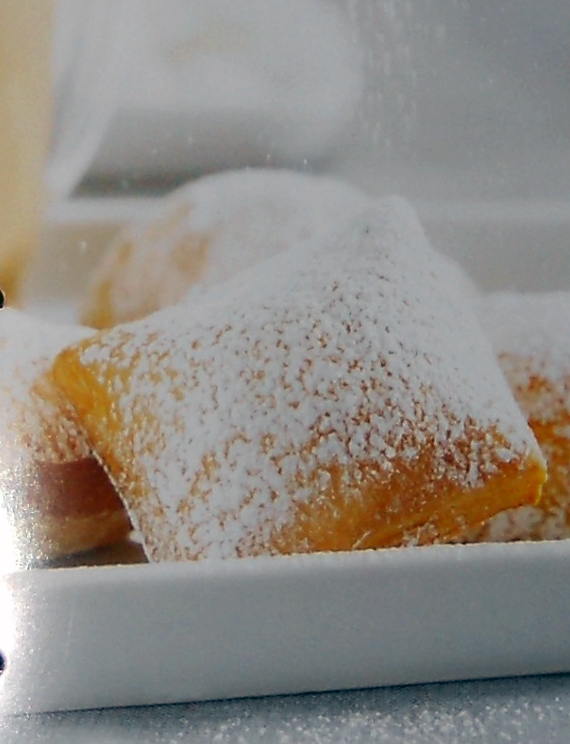 For those of you who have never heard of them beignets (pronounced “been-yea-s”) are basically fancy homemade doughnuts (meaning we’re not going to make them out of canned biscuits. This is a recipe from the KitchenAid collection. Dissolve yeast in warm water, set aside. Stir together granulated sugar, shortening, salt, and boiling water in large bowl. Stir until shortening is melted and sugar dissolves. Add cream, egg, 3 cups flour and yeast, stir to combine. Stir in remaining flour 1/2 cup at a time, mixing until soft dough forms. Turn out onto lightly floured surface and knead for approximately two minutes. Roll into a 24×2-inch rectangle. Using a sharp knife, cut dough into 2-inch squares. Pour oil into a heavy saucepan or deep fryer to a depth of 2-inches. Heat oil to 360° F.
Fry doughnuts 4 at a time, turning to brown on both sides, about 3 minutes. Drain on paper towels and sprinkle with powdered sugar. *Doughnuts can be filled with custard, whipping cream or jelly with a pastry tube prior to sprinkling with powdered sugar.